Rogue Valley Veterinary Hospital offers complete and rapid radiology diagnostics. 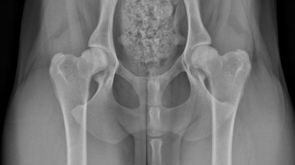 We provide general X-rays, OFA of hips and elbows, and are a certified provider of PENN Hip analysis for the detection of canine hip dysplasia. Our top quality radiology department will search for fractures, stomach problems, obstructions or other underlying issues and will review the films with you on site. Need answers? Our veterinarians at RVVH are here to look for the answers that will help your pet on the road to recovery. At RVVH we offer PennHIP screening. This is a multifaceted radiographic screening method for hip evaluation.The PennHIP method of evaluation is more accurate than the current standard in its ability to predict the onset of osteoarthritis (OA). Osteoarthritis, also known as degenerative joint disease (DJD), is the hallmark of hip dysplasia (HD). PennHIP is more than just a radiographic technique. It is also a network of veterinarians trained to perform the PennHIP methodology properly and, perhaps most importantly, it is a large scientific database that houses the PennHIP data. Radiographs are made by certified PennHIP members worldwide and are sent to the PennHIP Analysis Center for evaluation. The resulting data is stored in the database, which is continually monitored as it expands. As more information becomes available, the PennHIP laboratory is able to obtain more precise answers to questions about the etiology, prediction and genetic basis of hip dysplasia. Rogue Valley Veterinary Hospital offers OFA quality X-ray services. The OFA was formed in 1966. It is a database to health screen hundreds of thousands of dogs. The database not only includes the hip dysplasia data but also data on elbow dysplasia, congenital cardiac disease, patellar luxation and more breed specific tests. 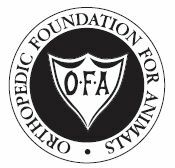 The OFA has about 25 independent radiologists, each board-certified Diplomate of the American College of Veterinary Radiology, to evaluate each radiograph. For more information on OFA certifying your dog contact our clinic at (616) 863-9390.